Vitamin C is a water soluble nutrient well known for its vital role in immune system function. * It is also a potent antioxidant that can protect the body's cells and molecules from damage by free radicals and reactive oxygen molecules generated during normal metabolism and typical environmental exposures. 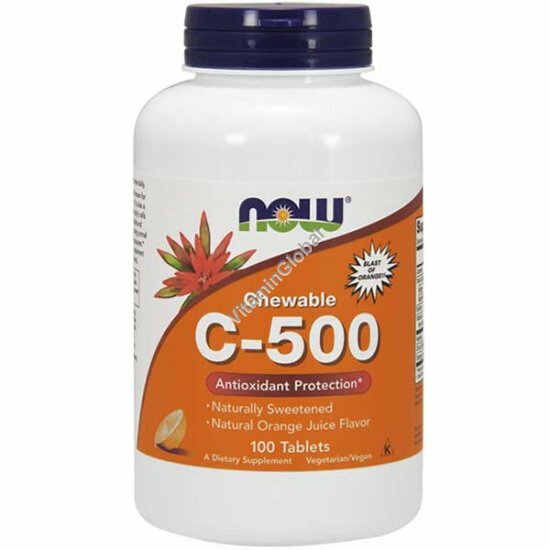 * This great tasting chewable Vitamin C supplement is naturally sweetened and naturally flavored. Other Ingredients: Organic Turbinado Sugar, Sorbitol, Cellulose, Xylitol, Natural Orange Fruit Juice Powder, Stearic Acid (vegetable source), Natural Flavors, Organic Stevia Leaf Extract (Enzyme-Modified Steviol Glycosides), Magnesium Stearate (vegetable source) and Silica. Suggested Use: As a dietary supplement, chew one or two tablets daily. Caution: Consult physician if pregnant/nursing, taking medication, or have a medical condition. Keep out of reach of children. Natural color variation may occur in this product.